To Plan The Perfect Baby Shower! Each month we look forward to updating you with the latest and greatest information on all of our new Baby Shower Gift Products and Baby Shower Planning Ideas with The Sacco Bambino VIP List Newsletter. We also keep you updated on all special offers and promotions at Unique Baby Shower Gifts. Some offered only to You, our Special VIP List Newsletter subscriber. Discover amazing gift ideas and baby shower party planning invitations, favors and more ... SaccoBambino at Zazzle.com! Find not only our cute and fun designs, but also to a million other resources for all kinds of gifts for any occasion, including lots of other awesome baby shower gifts and planning products. Enjoy! We know how busy you are with getting ready for Santa, so we're going to make this months newsletter short and sweet! (well, as short and sweet as we can ;) Candy hearts sweet, that is. Sure, it's still freezing outside, but if you're planning for a Valentine's Day Baby Shower, it's time to start thinking about your sweet party plans. Be sure to take a peek at our Valentine's Day Baby Shower section of our Unique Baby Shower Themes page. We have some terribly cute Valentine baby shower favors, along with invitations you can personalize to make your own unique Valentine Baby Shower Invitations. We have more ideas to share with you below. But, first things first. Back by popular demand, our free baby shower invitation of the month is from our 2011 collection and simply Loved by all! So, if you're planning a Valentine's Baby Shower, you're going to adore this pick, and remember, it's all about early planning. Simply download and print ... it's easy! We know you will enjoy using these adorable invitations as much as we enjoyed making them. So convenient to print and great to hand out to family, friends and co-workers. And, we've made it even easier to download our invitation of the month! Go to our VIP Invites page and you'll find the Free Baby Shower Invitations of the Month from all of our past newsletters, including this one from December 2011. Tip: Don't forget envelopes if you need them, they're on the same page ... Our Free baby Shower Invitations fit perfectly into these great quality envelopes. Your guests will think you spent a fortune on your "custom" invitations and quality envelopes ... don't worry ... our lips are sealed! ;) Enjoy! Get Started On The Right Foot In 2013! We know it's December, but catch those after Christmas sales to start building next years Christmas gift list. You'll save a bundle by shopping early. So, remember to buy your Holiday Gifts starting in January. Check our reminder each month found at Baby Holidays Gift Ideas and keep up with your monthly gift purchases. It's such a great feeling at the end of the year. You can spend your Holidays "Happy" instead of "Frazzled"! Share our website right now with your friends and let them in on our free baby shower invitations, our promotional deals and ... of course, free baby shower planning ideas. Tell them how easy it is to subscribe to our Sacco Bambino® VIP List Newsletter. Also check out "Who’s Due" ... on our “Celebrity Baby Shower” News and Updates! new is added to our site! 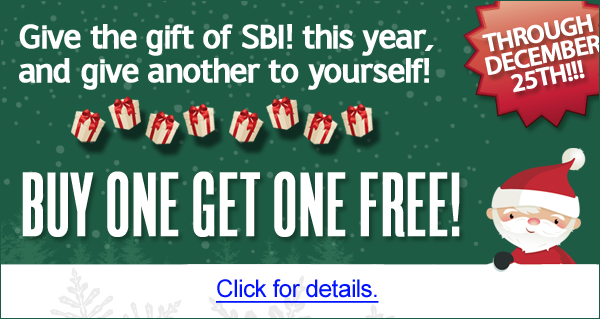 Right Now until December 25th at midnight, you have the opportunity to Buy an SBI! Website and Get One Free!